From best newscast to best drama series, GMA News TV Channel 11 was the big winner in the television categories at the 2013 Catholic Mass Media Awards (CMMA) held last Friday. The country’s leading news channel proudly took home 6 CMMA trophies in the TV categories - more than any other network. 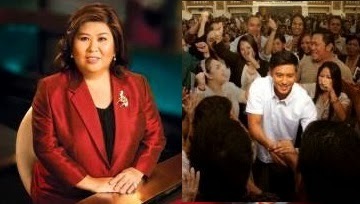 In-depth primetime news program State of the Nation with Jessica Soho received the award for Best Newscast. Groundbreaking political drama Bayan Ko was awarded as Best Drama Series. Hard-hitting and heavily research-based Investigative Documentaries, hosted by Malou Mangahas, won as Best Public Service Program. Info-packed Poptalk with Tonipet Gaba took home the award as Best Children and Youth Program. Showbiz reality show Follow That Star won as Best Adult Educational Program while travel show Biyahe ni Drew received a special citation also in the Best Adult Educational category. Meanwhile GMA Network’s Kapuso Mo, Jessica Soho was recognized as the Best Magazine Show in the country, Pepito Manaloto won as Best Comedy Program, while the news coverage Habemus Papam took home Best Special Event Coverage. GMA’s popular election advocacy anthem Dapat Tama, composed by Gloc9, won both for Best Secular Song and Best Music Video. Chosen by jurors from the academe and the clergy, the annual Catholic Mass Media Awards pay tribute to media that is responsible, skillfully produced and value-laden.